Well-manicured course in nice park in foothills of Rockies. Multiple pin placements. Creek comes into play. Lots of facilities. Redesigned in 2011 and 2013. Bring the map to avoid navigation issues. Prospect St. west from I-25, left on Riverside Ave. Turn into the parking lot for EPIC and park in the BMX parking lot and grab a map from EPIC Center before crossing over the bridge to the 1st tee. Excellent well manicured course. Lost basket on hole 10. Beware of the creek. The water's deeper than it looks if you go in. I'm thinking about getting some waders and a net and going fishing for a lost disc. This is the best course in Fort Collins. The biggest down side is that it is the best course in Fort Collins, and is almost always busy. They've recently re-designed the layout and direction of many of the holes, so if you haven't been here in a while, you should definitely check it out. They seem to move baskets about ever 4-6 weeks, so even if you played this season, odds are they've changed to a new location (each basket has 3+ options for where they are placed). Well worth the visit. My home course has been redesigned and is greater than ever! As a flight attendant I get to travel and play courses all over the USA. This course is the course I compare all others to; and with it's 2011 redesign it is more challenging and has a better range of hole placements than before. Several holes are challenge your distance abilities while just as many challenge your ability to place a disc near to certain pin locales. Many a day the wind will come into play on at least 6 holes while the remaining 12 holes are protected from wind interference. Lots of people play this course so you can always walk on and join another team of players. I have been to course where NO ONE is within 20 miles; making it a very boring experience. For a local park course, this is a great course. There are plenty of holes that challenge your ability with varying lengths and obstacles. There are three basket locations for each hole (except for the 18th, which has 4 or 5) and the basket locations are changed periodically to keep the game interesting and fun. It is a city park and the course is maintained well. Holes 7, 8 and 11 are next to water and if it goes in the water you will not get your disc back (know your skills). The only down side to the course is the number of people that play there. I almost always have to wait in line at the first hole to begin play and often wait behind others before starting each hole. It doesn't bother me, but it does make the game a little longer. If you are looking for a quick game, this is not the best choice in town. Amazing Course !!!! Has everything for every type of player whether you like a tight course that requires accuracy or a course with wide open holes where you can just throw long bombs. This is for you. Best hole in my opinion is the 550 plust ft # 6 its down hill and wide open so you can grip it and rip it. Some other interesting holes on the course is #11 which is at its furthest like 250 feet but there is a massive lake to your right so i would recommend a floating disc in case it goes to the right. With pin locations far from the lake and right on the edge accuracy is required to score well. Course can get packed especially on warm days. Enjoy !!!! With well manicured green grass and scenic evergreen and large deciduous trees scattered throughout, this is an inviting course. This has become one of my favorite types of terrain. It’s hard to lose a disc, and you don’t have to fight much shule. I’ve been playing here since 1999, and I always a enjoy my rounds. By and large, the course is relatively open, and there are a few open field holes where the big arms can watch it fly. There are many birdie opportunities out there, even for shorter throwing Intermediate players like me. A creek and small reservoir come into play on 6 holes. *There are up to 3 basket positions per hole, so that make for a lot of variety in fairway shapes and length. (A few holes have 4 to 6 basket positions!) Lengths vary from 172 to 582 ft. Overall, the majority of the holes are in the 200-399 ft. range. I’ve always seen the course have the basket layouts mixed around between A, B, or C. While this adds endless variety it loses the purity of being able to play just the A, B, or C layout all in the same round. There are some moderate elevation changes and some scenic shots. *I’m always in Fort Collins in July and I love the clear, low humidity air; this a big change from humid North Carolina and a real plus for me. I really enjoy playing the course on a cool clear morning. *Tee signs have hole maps and layout lengths. Tee pads are first class! They are 20 ft long wide trapezoids. *There’s a pretty good map on the internet and hole maps on the tee signs. There’s a restroom at hole 9. There’s also a warm up basket (it’s a little old), a pretty good message board, and many trash cans. No benches on the course, though. The park is very clean with very little trash. -With 3 or more basket positions per hole it would really help to have the current positions marked. -Because there have been a number of changes to the course over the years the layout lengths on the maps often don’t match the lengths posted in various places online, so it’s very hard to tell which length is accurate and the most up to date to use. -Some tees are hard to find. Tee 3 is across the parking lot. Tee 5 is a long walk down the road. Tee 6 is across the street and up the hill. Tee 12 is a really long walk up the hill by the skateboard park. It would help to have some signs to point the way. My favorite hole = 11. There’s a very scenic small reservoir all on the left side, and with 5 basket positions there are varying lengths and varying degrees of risk vs. reward. Hole 3 is also fun. It’s a fun downhill left curving shot. 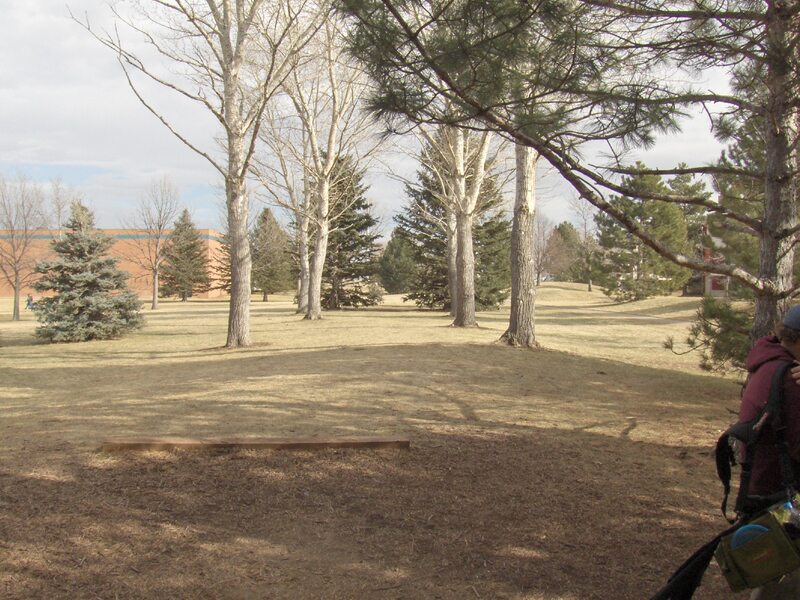 The drive is open so you can watch your disc fly, but the basket is strongly guarded by a small grove of pine trees. I would enjoy being able to play the course with the baskets all using the same A, B, or C positions. In summary, this is a fun course with a lot going for it that I enjoy every time I play. NOTE: My files with Hole-by-hole ratings, and detailed Overall review notes can be found at DG Course Review, http://www.dgcoursereview.com/ First, search for the course, then look for the files in the tab marked "Links/Files". My screen name is “Olorin”, so look for files with that name in it.